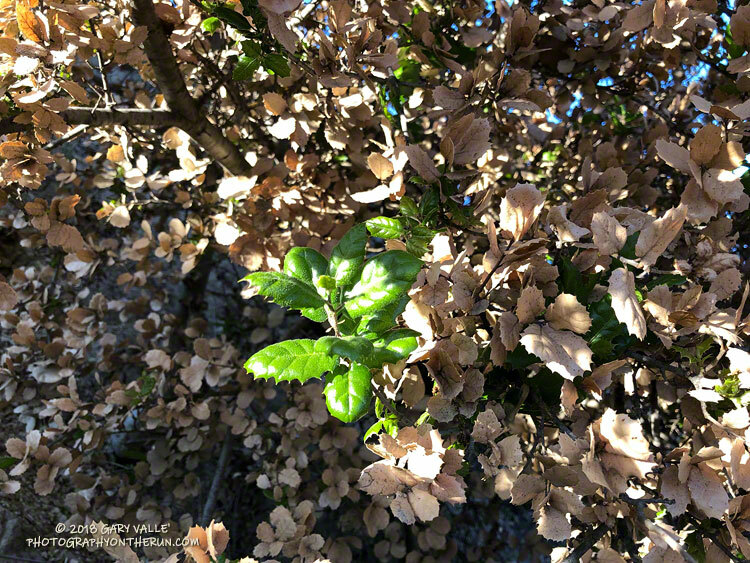 Many of the live oaks and valley oaks in the Woolsey Fire burn area have withered, brown, scorched leaves. As bad as they look, most of these trees will replace their foliage and recover. Today I was excited to see foliage replacement occurring on several live oaks in the northeastern area of the fire. This also happened about a month after the 2005 Topanga Fire. 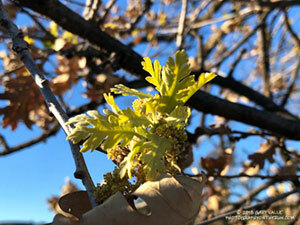 Sprouting valley oak leaves following the Woolsey Fire. Back in 2005, valley oaks also started replacing their leaves about the same time as the live oaks. That might not happen this time. Valley oaks are deciduous and the Woolsey Fire occurred later in the Fall than the Topanga Fire. Now is about the time valley oaks would be losing their leaves. That may affect the timing of their foliage replacement. We’ll see! Update January 2, 2019. Some valley oaks in the northeastern part of the Woolsey Fire area are starting to sprout new leaves!